The Jukebox Man is the specialist for Juke Box Parts and Repairs. Valve Amplifier Specialist . Over 40 years experience . Discuss your jukebox repair needs and spare parts requirements with Geoff . Follow the link above “Repair Shop” for answers to some Frequently Asked Questions. Vintage Wurlitzer Jukebox spare parts, Vintage Seeburg Jukebox spare parts, Vintage Rock Ola Jukebox spare parts, Vintage AMI Jukebox spare parts! © thejukeboxman all rights reserved. 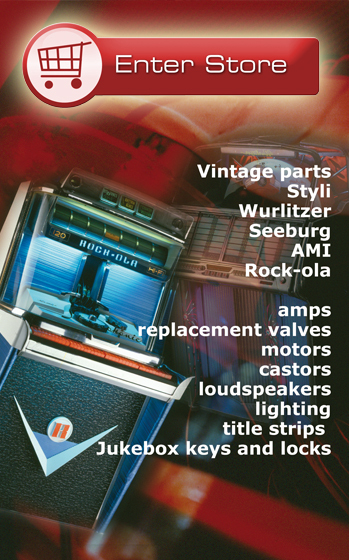 Jukebox spare parts for vintage Wurlitzer Jukeboxes, Seeburg Jukeboxes, AMI Jukeboxes, Rock-ola Jukeboxes, from Europes leading Jukebox spare parts supplier. Jukebox parts and Jukebox spares, Jukebox needles and styli for all makes of jukebox including Wurlitzer Jukeboxes, Seeburg Jukeboxes, AMI Jukeboxes, Rock-ola Jukeboxes. Jukebox amp replacement valves, motors, castors and loudspeakers. Jukebox Maintenance, service. Record dinkers. Jukebox title strips. repairs to all makes of Jukebox (except NSM and Jupiter). Jukebox keys and locks.